> Pressbooks>CLOSE ENCOUNTERS OF THE THIRD KIND pressbook '80 Steven Spielberg sci-fi classic! CLOSE ENCOUNTERS OF THE THIRD KIND pressbook '80 Steven Spielberg sci-fi classic! Close Encounters was a long-cherished project for Spielberg. In late 1973, he developed a deal with Columbia Pictures for a science fiction film. Though Spielberg receives sole credit for the script, he was assisted by Paul Schrader, John Hill, David Giler, Hal Barwood, Matthew Robbins, and Jerry Belson, all of whom contributed to the screenplay in varying degrees. The title is derived from ufologist J. Allen Hynek's classification of close encounters with aliens, in which the third kind denotes human observations of actual aliens or "animate beings". Filming began in May 1976. Douglas Trumbull served as the visual effects supervisor, while Carlo Rambaldi designed the aliens. 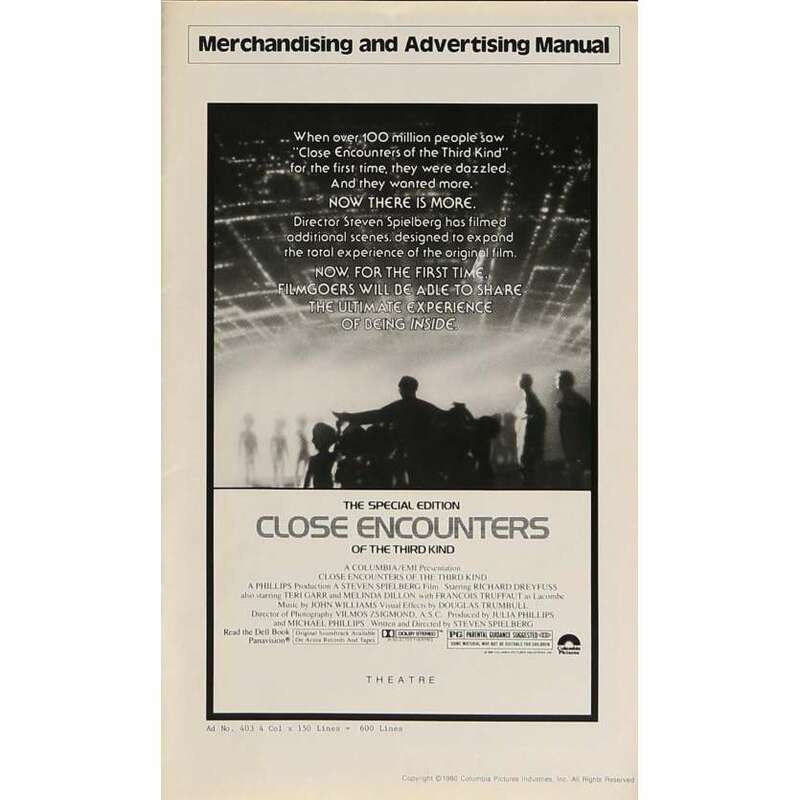 Close Encounters was released in November 1977 and was a critical and financial success. The film was reissued in 1980 as Close Encounters of the Third Kind: The Special Edition, which featured additional scenes. A third cut of the film was released to home video (and later DVD) in 1998. The film received numerous awards and nominations at the 50th Academy Awards, 32nd British Academy Film Awards, the 35th Golden Globe Awards, the Saturn Awards and has been widely acclaimed by the American Film Institute. In December 2007, it was deemed "culturally, historically, or aesthetically significant" by the United States Library of Congress and selected for preservation in the National Film Registry.